He’s too little. She’s not big enough. Have you ever heard these things? Or, have you said them yourself about your little ones? If so, let me encourage you to look at your preschoolers a little differently. Even our littlest ones are capable of so much more than we think they are. And, more than that, they want to help us out. It makes them feel big. It helps build their self-confidence when they think they are being big helpers. If you want your big kids to pitch in, you have to start training them early. One day, no matter how hard we try to keep them little, they will need to know how to care for themselves. How can you train your little kids to be independent big kids? Give them jobs to do around the house. Even a child as young as two can pitch in with household chores. Preschoolers can empty small trash cans and wipe off kitchen tables. They can help gather laundry and put away their toys. Everyone loves to feel needed, and our littles are no exception. Give them jobs to do around the house, and watch them beam with pride as the help you out. Teach them how to work. Teach your little ones how to do the jobs you give them. Don’t just hand them a washcloth and tell them to wipe the table. Teach them to wet and wring out the cloth. Show them how to move table items (dishes, food, etc) to a counter or island, or teach them who to ask for help with that job. Show them how to use two hands to run the cloth back and forth across the table so they don’t miss any spots. Tell them what to do with the crumbs? Should they brush them to the floor for an older child to sweep up? Should they brush them into a napkin to be thrown away. What seems like common sense to you will not necessarily appear so to a four year-old. Teach them how to do things step-by-step, and then work yourself out of that job. It is perfectly acceptable to expect them to do their jobs correctly, but remember that they are still young. I have always said “A job done by halves is never done right.” But, “right” isn’t necessarily perfect. Are the books on the bookcase? Great! Are they lined up biggest to smallest like I would do it? Probably not. That’s okay. The job is complete even if it’s not perfect. Praise them generously. Let them know how much they’ve helped you out. Tell them what “big” kids they are. Praise them for a job well done. They’ll be anxious to help again next time! 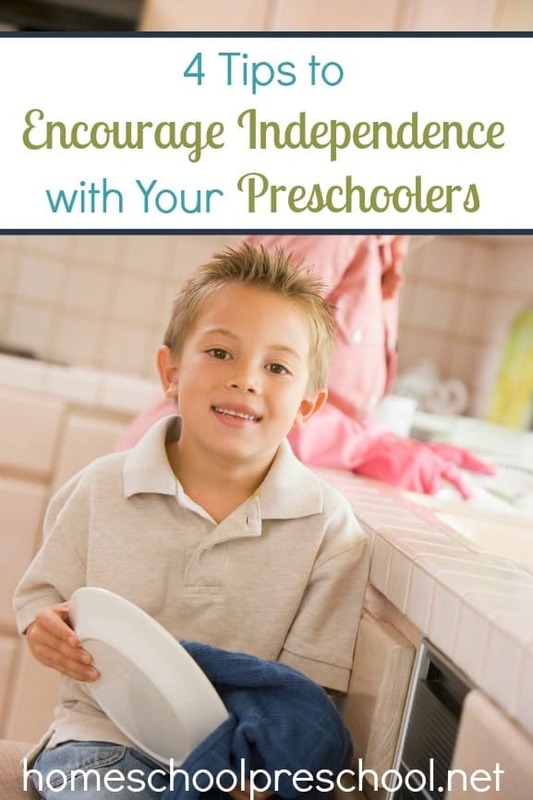 What do you do to encourage your preschoolers toward independence?